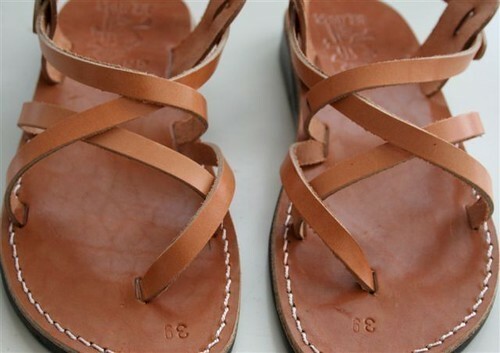 leather sandals sz 9/39 for sale::, originally uploaded by gracefullady. sweet! too bad my feet are larger... they're beautiful, Anna! I'm an interested lurker... normally I wear a 9.5 because my feet are a little wide for most 9s, but sandals tend to have more wiggle room. What do you think, are they a narrow 9? THanks! hm...it's hard to say. they are fairly loose on me (i also tend to go down a half a size when wearing sandals). and they definitely are not narrow sandals. they should fit a size 9 in length perfectly. and leather stretches (which is the big reason why i can't keep them). they look great, and are exactly my size... but I'm also wondering whether they aren't to big for me, since my feet are quite narrow but the length certainly is a size 9. what do you think? or have you sold these already? well, they don't seem too wide for my feet and i don't *think* i have wide feet, but since they are sandals they aren't super narrow. i can measure how wide they are from the insole if that is helpful. they haven't sold yet! i would totally buy these from you, but they aren't my size. you're awesome to pass on the link though - i've been looking for sandals exactly like because of "le vestiaire de jeanne." also the length is 10"